I don’t review TV, that’s not my interest and it’s not my focus. Also, I don’t watch a ton, I’ve always just stuck to a few reality shows just for fun, and I’ve successfully stayed away from the dramas and comedies that American audiences can’t seem to avoid watching. Recently, with the emergence of HBO and then of Netflix, TV has become something more solid, approaching film if never quite catching up, and some of it has demanded my attention. I watch OITNB, Stranger Things, Black Mirror, a few like that, and I’ve learned to let them entertain me without having to critique them too harshly. Also, in the past and present, I’ve stumbled upon a few short-run shows that I enjoyed very much, like Band of Brothers, Godless, Rome, Lonesome Dove, and Firefly. Here’s my review of the latter, a sci-fi series that was on its way up, but was cancelled far too soon. Serenity, a Firefly-class vessel that roams the outer planets, houses a ragtag bunch of criminals and runaways who want to stay as far off the beaten path as the can. The Alliance rules the stars, but the crew of Serenity live by their own rules, traveling space, dodging death, picking up odd jobs as they come along. Malcolm Reynolds is the captain, Zoe is his trusty first mate, Wash is her pilot husband, Kaylee is the plucky engineer, Jane is the muscle, and Inara is a permanent house guest whose professional is the oldest in the galaxy. But it’s not until they pick up a few passengers that their real adventure starts. Shepherd Book is on the move and far away from his monastery, brother & sister Simon & River are on the run after a narrow escape; their troubles will follow them onto Serenity and through the universe, but the relationships they form on board will tell their true story. 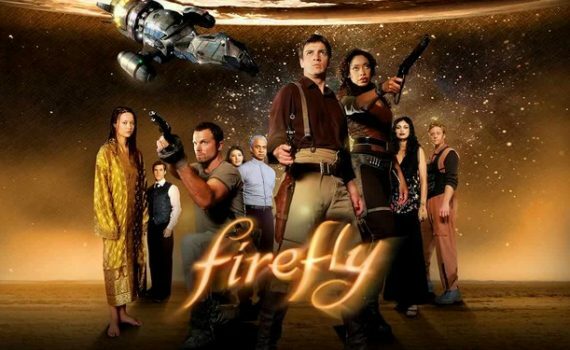 Joss Whedon did Buffy first, moved on to directing a couple Avengers movies, and has written a few random films along the way, but his accidental masterwork is Firefly, a series that wasn’t really understood or appreciated until it was gone. It inspired Battlestar Galactica and was crafted as a sci-fi/Western where everyone spoke both English and Mandarin; sounds odd, is odd, works oddly well. At first, the quality seems insurmountable awful, like a SyFy Channel original, or something even worst. But after a few episodes, the idea begins to coagulate and the cast begins to mesh, bonding into something special. It’s a space show with a wild west feel, and it works swimmingly, those frontiers having a lot in common naturally. Once you get to know the characters, you can’t help but root for them, love them, and wish them well. Fillion, Torres, Maher, Baccarin, Alan Tudyk, Adam Baldwin, Jewel Staite, Summer Glau, Ron Glass; it’s a cast that doesn’t translate well to movies, but they are a collective x-factor here. The show was cancelled before its time; so much god-awful TV is pumped out every year, it’s a travesty that this particular series wasn’t picked up. Watch ready to invest 10 episodes before you completely buy in, and be prepared for it to end abruptly, but enjoy something unique and be glad it was ever made.